The following interview with a friend of mine took place in May, 2012. Ruth kindly provided the photos. An Australian journalist, Sarah Turnbull, wrote a fascinating book called Almost French: Love and a New Life in Paris after she’d a married Frenchman and was navigating her way through the cultural minefield that is France. I could call myself “almost Japanese,” and recently I’ve become a housewife. It took nine years to get here. When was younger I wanted to be a psychologist, and I had fantasies of living an exotic international lifestyle in Italy or England. But a year out of university I was working at a horrible job. Someone who’d taught English in Japan suggested that I should try that. I said, “I don’t know any Japanese people, I don’t speak Japanese, I don’t even like fish.” I was living in Brisbane, and a company with schools in Japan had an office there. I went to a couple of interviews and took some tests, and I was told, “In eight weeks we’re going to sort out your visa.” Then I found myself on a plane for a place I’d never heard of where I was to teach at a big Japanese conversation school. Nowadays, I’m in Toyokawa, a regional city which the Japanese call “the country.” There’s no English menu at the restaurant. Nobody at the hospital can help you in English. You can’t speak to anyone in English on the bus or at the train or the shops. It’s not like being in Tokyo and working for a foreign employer, which is America with a Japanese backdrop. But that was how I lived for the first two and a half years. The job called for me to speak English all day. The staff spoke English, I lived in an apartment with other foreigners, and I only went out with people who could speak English. I didn’t need to know about taxation or medicines. Everything was taken care of for me. But then the company was going bankrupt, and I’d gotten really bored anyway. They’d changed the textbooks so there was no creativity left in the lessons. It was all teaching by the book for eight hours a day to either little children or adults. I only felt I was using my brain when I went to aerobics. Living in this insular community was like having been sucked into a vacuum and not knowing how to get out. I applied at a private school which contracted teachers out to different schools in the region, even though it was frightening to think of moving into an apartment by myself and traveling to so many places in one week: private cram schools, private junior high schools, smaller private classrooms. Children, adults, everybody. I really needed to speak Japanese. I might only speak to a native speaker of English once a week. A friend of mine hooked me up with a professional teacher of Japanese. A lot of foreigners learn Japanese from volunteers, but this is probably the best investment I’ve ever made. There was another Australian at a junior high school where I taught, and he could speak Japanese fluently. When he talked with people I had no idea what they were saying. I felt inadequate, but I decided I was going to do this. Fortunately, I came a long way in a short time. It was in this “life’s getting interesting” phase that I started dating Shōichi. He could speak English, but I was trying to speak Japanese, and I started to feel that I really was in Japan. In Japan foreigners are put in boxes as “a student,” “a person working here for a short time” or “a tourist.” You’re not actually a person. As much as I’ve been irritated by some things, I’ve always been okay with the fact that I will never be considered Japanese. Many of my friends and acquaintances try so hard—not just to fit in because fitting in is different—to be accepted as an equal in Japanese society. For women who’ve had children, dealing with the mothers of their children’s friends seems to be a constant struggle. However, just as I surrendered to the fact the language was going to be difficult, subconsciously I must have accepted the fact that I would not become Japanese. Most foreign women don’t stay here. Unlike many of the men, those of us who’ve been here for a while don’t think we’re going home. It seems women can see Japan more clearly, and this has informed our decision to stay here. Looking out the train window, you see that the cities all look the same, really concrete and really ugly with patches of nature in-between. But there’s much more beauty inside, in the rhythm of life and in the creation of small things, in manners, in the language and the ways people relate to each other. I’m a dancer. I started doing ballet as a child, and it’s really in my soul. In Australia the drum beats a really slow rhythm which is always the same. When I get off the plane I feel that life has shifted down three or four or ten gears. In Japan there’s a rhythm to everything, whether it’s the woman at the supermarket putting the stuff in the basket or the cars waiting at the stop light or the people walking their dogs or the announcements at the train station. The various rhythms which should be fighting against each other aren’t. They’re blending together. In Australia there’s nothing beautiful about a formal meeting. Here when visitors come into the workplace everyone snaps to customer routine, and there’s a dance that you do. There’s a bowing here and here and everyone knows their place. It’s all like the choreography of a musical. My husband Shōichi teaches English at a junior high school in our town. He works sixty to ninety hours a week all year round. In Japan education is a much more honorable, respected and probably a better-paid position than in Australia. Before we were married we found an apartment together, but then I experienced one of the unpleasant things women face here, unwanted sexual attention from strangers. This was not the first time. Once before when I was walking home a man had grabbed me from behind and touched my chest and then unzipped his pants to show me his stuff. I’d just screamed at him and run home. Being stalked was the most frightening experience of my life. With Shōichi leaving for work early in the morning and coming back late at night, it probably looked like I was living alone. I came home to find a letter addressed to me and sticky-taped to my bicycle. It was written in really bad English, and it said the sender was lonely and could we be friends and please return a letter taped to my bicycle. I threw it in the bin. The next day I got a letter in Japanese with pictures of a sexual nature drawn of me and this person. We went to the police, who took the letters and listened to my story. They didn’t really care. There’s so much of it. I got more letters, and the police came back to our house again and took photographs. I couldn’t sleep or eat, and I missed two days of work, which is something that I’d never allowed myself to do. Every day I was paralyzed with fear. We bought a surveillance camera to stick outside. At the end of the week Shōichi said, “Ruth, I talked to my parents, and they said we should move in with them.” In twelve hours we packed up, and that night we went to his parents’ house in Toyokawa. We’d only been in the apartment for two months, and we couldn’t get out of the lease. One day our landlady saw the man taping a letter to my bicycle. She tried to call, but she couldn’t reach us. 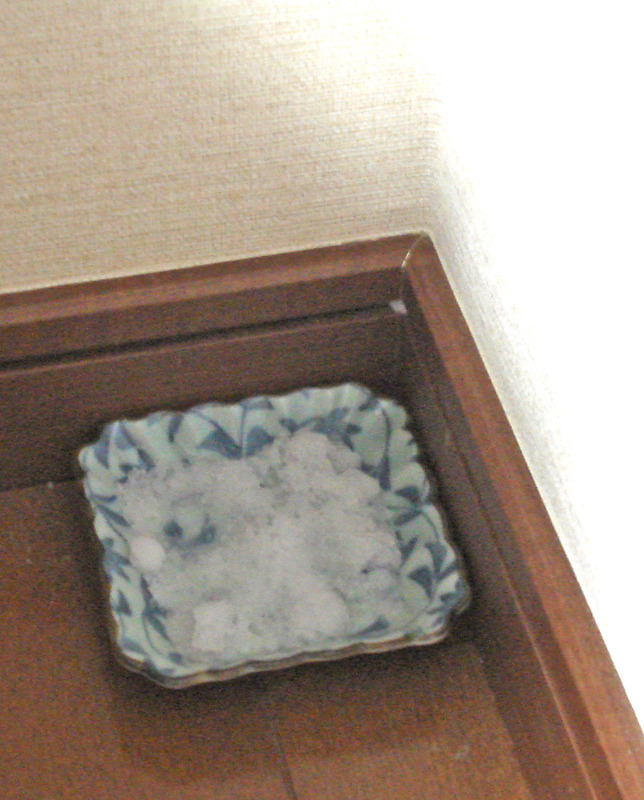 Anyway, in Shōichi’s parents’ house I was safe. I bought a car and got a driver’s license. It’s much safer in a car than in public transport, around train stations and in apartments, where there are lots of sexually repressed loners. We lived with his parents for six months, and I got to see how to live in Japan. I loved it. I’d come home from work and not have to cook dinner. They really liked me, and I liked them. We moved out because Shōichi and his mother argued a lot—although not about me. When we got married, it was Christmas Day, but just another day in Japan. We did the city hall thing, just filling out documents and handing them in. The procedure was happier and more wonderful than the wedding. We had the biggest smiles on our faces, and everyone in the office was smiling. I count our marriage as starting from that day because it was just us—no family and no ceremony and no need to be nervous or have expectations. Our wedding ceremony came eight months later. Nowadays Japanese brides have the big cream-puff ball gown and the pretend church. 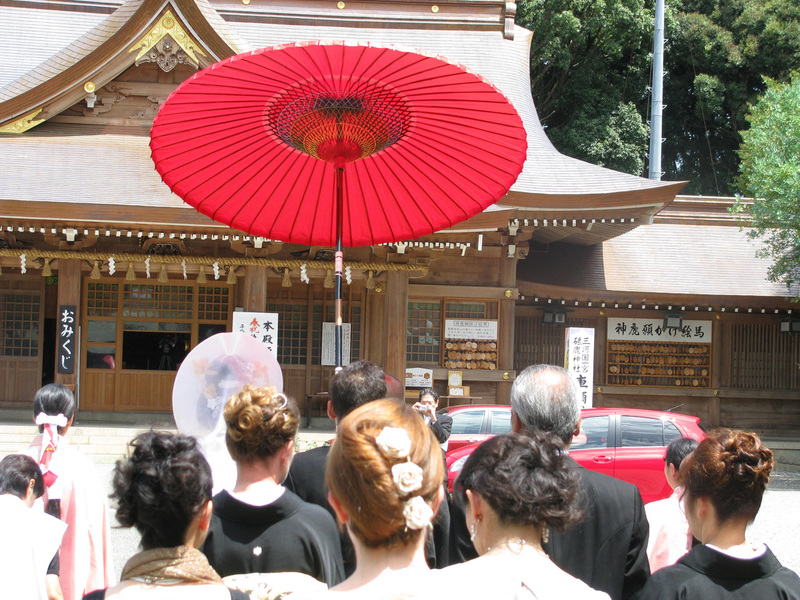 I wanted to get married in a Shinto shrine. Shōichi’s parents are pretty traditional, and they observe a lot more of the Japanese religious traditions than most people do. They practice a Japanese version of feng shui. 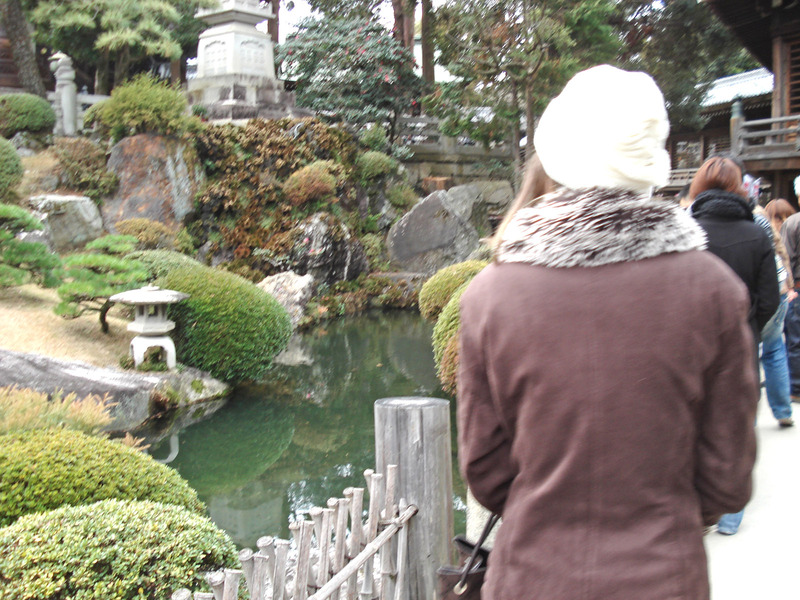 When a change in life happens—changing a job or building our house or naming a child—we go to a place that looks like a Shinto-Buddhist garden and ask for advice. Even today we keep a little container of salt at the four corners of our house and in the four corners of our land. His parents were really surprised that I wanted to have a Shinto wedding and wear kimono and a heavy wig. 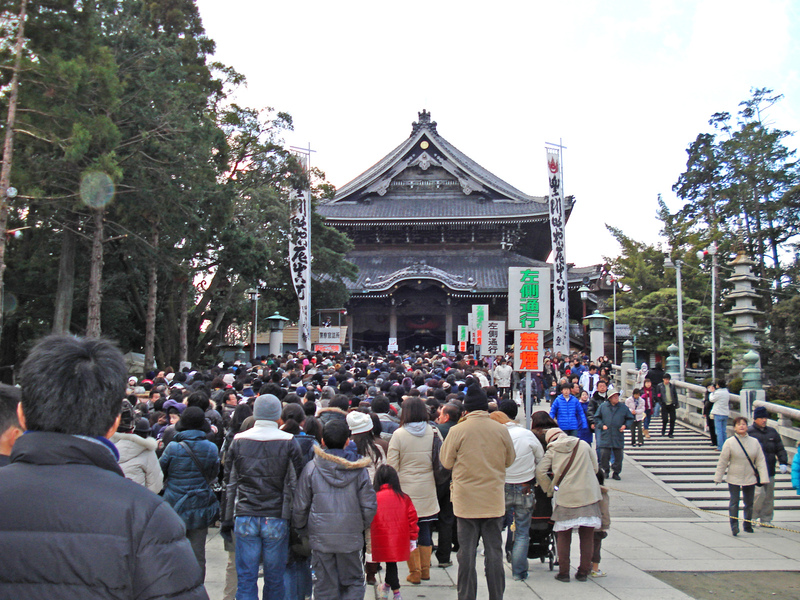 As you probably know, for death rituals the Japanese go to Buddhism, but for birth and marriage and stages in life they go to the Shinto traditions. We had the wedding in the shrine and the reception banquet in a building in the compound. It was hot, and I was sick with tonsillitis, and my period came during the kimono changes, but still it was the best thing I’ve ever done. I don’t look beautiful in the wedding photos because of how sick I was, but I did have the white makeup on my face. My mother and two friends came from Australia. Everything was amazing to them, the heavy clothes and walking in little steps, having a woman to hold my kimono and all those words they couldn’t understand. For the first half of the reception I stayed in the white kimono. I made a speech in Japanese. In Japan it’s unusual to reveal your emotions, but I wanted to say what I felt about my husband and our relationship. All the Japanese speakers cried. Then Shōichi gave a speech in English, and all the English speakers cried. The Japanese don’t often talk about being moved, but they were. An older woman told my mother, “I didn’t even cry at my son’s wedding.” I felt so proud. Even though I’d wanted this for myself, one of the rewards was having young and old relive a traditional wedding. Watching Shōichi’s school friends cry in our ceremony was really special. I continued working for the English school. The money was good, and the hours were light enough so that I could start teaching ballet. Learning Japanese, having to be on my own at work, having a driver’s license and cooking Japanese food gave me the feeling that I was living in the real Japan. I joke that Shōichi has three household chores—taking out the garbage, picking his socks up off the floor and complimenting me at mealtime. The division of domestic labor is 100% a woman’s job. You need to get along with the neighbors, be part of the neighborhood association, pay the bills and learn how to take care of the house. In Australia we don’t worry about airing the mattress or bring the washing in on time or buying particular foods at particular times of the year. Until I quit my job, I always felt tremendous guilt. Once the next-door neighbor came over and said, “It’s going to rain. You need to pull your washing inside.” I felt like a failure as a woman with the people on our street checking whether I raked the leaves out of our front garden and whether I got my washing in before sundown. A year after we were married we went to Italy for our honeymoon. Then we had our house built, and life began to change again. I took a job which because I was a woman I really had to fight for. In Japan if you’re a man people assume you’re responsible and hard-working, despite the stereotype of Westerners as fat, lazy and late for everything. I was hired by the board of education in another town. There were other foreigners with this job too, but I seemed to be doing better, whether because of my teaching experience or my Japanese language skills or because I’d learned how to behave Japanese. I’d found it easy to copy my mother-in-law’s mannerisms, speech patterns and posture, which stood me in good stead. People said, “Oh, you have Japanese atmosphere.” While I was never accepted as Japanese, I was never treated like a guest either. In the staff room I answered the phone, and I stood up and sat down at the right times. I did all the things people don’t like to do that foreigners can get out of. I went to all the events outside of work and paid the money. This helped me fit in better even though it cost me personally. I found it difficult to do the housework, finish my Japanese homework, teach ballet, and teach English in elementary school and junior high with an hour-long daily commute in heavy traffic. That board of education really pushed English, requiring perhaps double what other Japanese kids receive. I didn’t just show up at school and hear, “We’re going to do this today. Ruth, please read this passage.” I was doing the lessons by myself and disciplining the children in Japanese. This had great benefits because I learned how to speak to people above me and below me. Rank and level are very important, and they’re reflected in the way that you speak to people. My colleagues were forgiving of my mistakes. Every day I felt nervous, but I did well. I was the one picked—above the male foreigners—to be part of lectures to teachers renewing their license. My lessons were studied and videotaped and taken into other prefectures as models. So in this very small circle I had become a superstar, but I didn’t want people to think I’d been asked because I was a pretty girl with a nice smile who could be very entertaining. I was pleased to get praise from the people who hadn’t wanted to give me the job in the first place. After three years, the government employees’ compulsory health check revealed that I had very high blood pressure. So now I’m a full-time housewife teaching ballet once a week and studying Japanese. I go to hospital every month for tests, but no one ever asks about stress. When I think of when I wanted to be a psychologist and I wanted to be in Europe, it’s almost as if I’ve let myself down. The funny thing is, only four days after I left the job, my boss drove out to collect my health insurance card, and he said, “Ruth, the woman that’s replaced you is pregnant. Do you think you can come back in November?” So I don’t think this is the end of the story. Shōichi doesn’t expect me to be Japanese like the social rules do, or not-Japanese, like the people I meet on the street. The only time we argue is when I insist on knowing why something is like it is or why I have to wait. The Japanese accept what they’re told because people better than they are have decided this and it makes everything run smoother. When I have something which is really bothering me, like taxation or insurance documents, I talk to him about it, and he doesn’t seem to be irritated or defensive. I’m not sure whether that’s because we’re in love or because he’s broadminded or because he spent eighteen months in New Zealand. He’s also a very handsome man, which is nice. I can’t believe I met someone who would fulfill all my requirements. Shōichi and I tell each other everything, perhaps because we would have misunderstandings otherwise. We can’t read each other the way an Australian couple can read moods or glances or body language. Everything has to be said because you can’t guess. I don’t really have words to describe it, but gradually something inside has shifted. I’m proud to be an Australian, but when I go back I’m just visiting. This must be more evident than I think because my mother sends me books about Australia and goes out of her way to remind me of who I am and where I came from. But here, if somebody asks, “Ruth, when are you going home?” without thinking I’ll say, “Oh, at five o’clock.” Home isn’t over there. It’s in this great foreign land that is Japan. That happens quite a lot. A great read, Carol. Very interesting and very well written! It brought me back to 1980. This hit me personally. I’ve been whining and ranting like a brat over the past few days because I may have to get married in a city where everyone is a stranger and insisting that a girl’s wedding is probably the most important part of her life and it should be as she had envisioned it while growing up. Ruth’s take on it, spoken so simply yet eloquently, poked my brain and made me realize it’s all about how I look at it and the constraints can also make it beautiful. Thanks, Carol.